An umbrella protects us from the rain, but it can also be used in other ways. So today, on Umbrella Day, we are featuring a different type of umbrella—one that was popular at bridal showers. It's an umbrella used as a gift holder. Located in the Trade Literature Collection at the National Museum of American History Library is a 1917 Dennison Manufacturing Co. trade catalog. Inside Art and Decoration in Crepe and Tissue Paper is a section with ideas for wedding and bridal shower decorations. One of these ideas is to use a decorated umbrella as a gift holder. The image in the catalog is of an umbrella decorated with rose petals on the top and a bouquet of flowers at the bottom. Long ribbons hang from the top of the umbrella, and as stated in the catalog, "the gifts may be concealed in the top or in a pan at the bottom. Gifts are drawn forth one at a time by narrow ribbons." Doesn't that sound like a fun and interesting way to open gifts at a bridal shower? To go along with the theme of an umbrella used as a gift holder, there are also small umbrella party favors. These small umbrellas are decorated with flowers and a bow and match the larger umbrella gift holder. Interested in more bridal shower ideas from 1917? Check out the Galaxy of Images for more pages from the Weddings and Showers section of Art and Decoration in Crepe and Tissue paper by Dennison Manufacturing Co. Image: Dennison Mfg. Co., Framingham, MA. 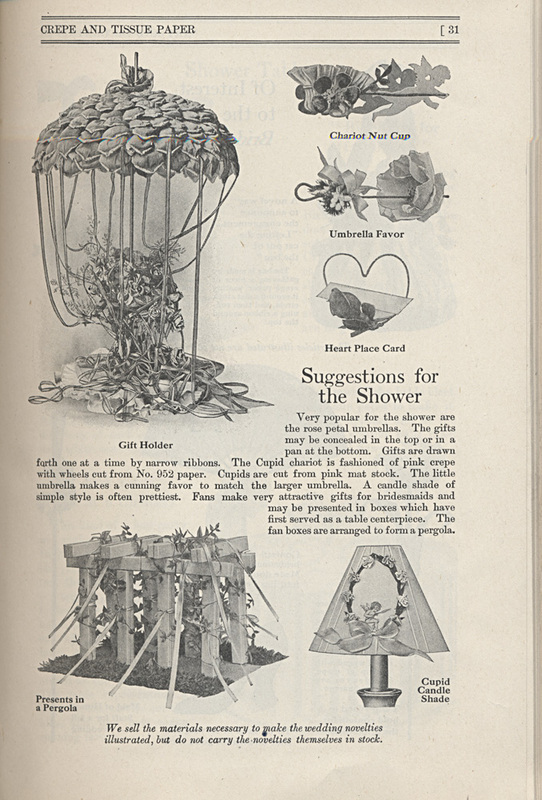 Art and Decoration in Crepe and Tissue Paper, 1917, page 31, Bridal Shower Suggestions. Love this! We just featured a photo shoot with a beautiful parasol.